Hot Holiday Online Shopping Tips | A Savings WOW! 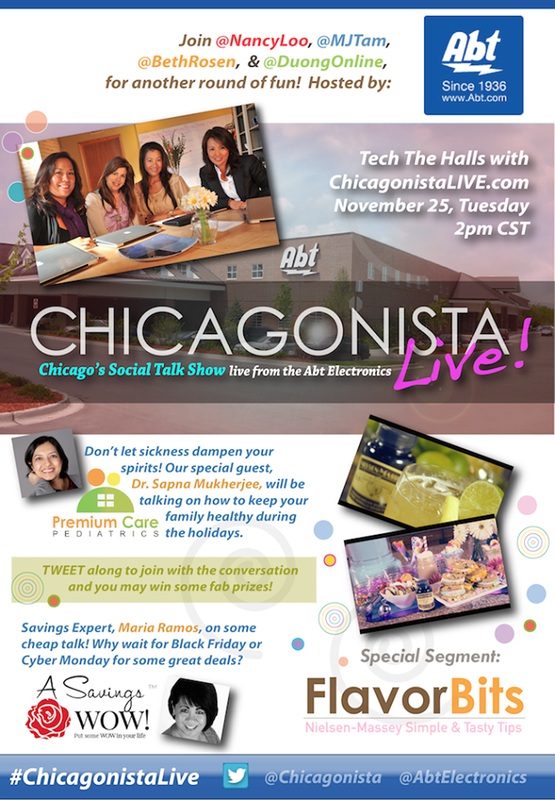 Welcome Chicagonista Live! viewers! Getting together with the wonderful Chicagonista ladies – MJ Tam, Beth Rosen, Nancy Loo, and Duong Sheahan is always a treat. A special shout-out goes to Abt Electronics for sponsoring today’s show. 1) Know what day and time the online sales will start for your store. We have a list of starting dates and times for some of the stores here and will continue to add to it as they become available. 2) Research the best deals ahead of time. Check out my extensive list of stores and their complete Black Friday deals. You can even do a search for what you are looking for (ex: laptop, printer, phone, toy, etc.) on here. 3) Search for online coupon codes to sweeten your deal even more. Check out our online coupons database (powered by Savings.com) and search for your stores. 4) Use free in-store pickup to save on shipping costs. Many stores, including Sears, Kmart, Walmart, Target, Toys R Us and Best Buy give you the option to order online and pick up your order in store. The beauty of selecting in-store pick up is that you can get the same deal online instead of fighting the lines in the store and then have the option to pick up your order on a different day. Personally, I like using the Shop Your Way app when picking up my orders from Sears because I don’t even have to leave my car. They bring out the orders right to me in my car. 5) Stack your savings with a sale, coupon, free shipping, and rewards/rebates. You may even save more than if you headed out to the stores. The best part is, you can shop in your pajamas in the comfort of your own home!